We manufacture High Precision Hydraulic Hose Ferrules also known as Hose Caps. High Graded Steel SAE 1018 round bar is used as raw materials (only from approved Mills). 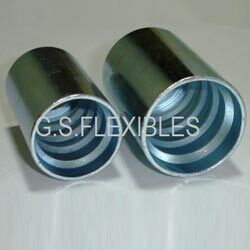 We manufacture wide range Hose caps for manufacturers of Hydraulic Hoses OEMS on contractual basis. Hose Caps are manufactured as per the guidelines of ISO 8434 & ISO 12151 and customer requirement specification. General size range includes R1 / R2, 4SP, 4SH and many other specialized Hoses.